While I was thinking about my own resolutions, I of course did some Googling. 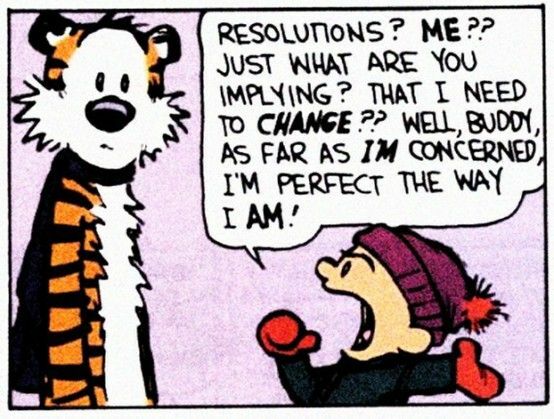 Here are some great resolution ideas for you that can both better your life and are actually doable. Don’t try them all at once, but they are good ideas to start making small changes in your life! Try 52 new foods this year. Once a week, cook at home and make a food you’ve never tried before. It will help you start cooking at home, and it will feel like an adventure! Stop looking for a soul mate. Studies show that having things in common or compatibility aren’t what actually makes good relationships. Two people who really want to give it a shot are more likely to make it than two who like the same things. Change the info you take in. There’s been lots of debate about how technology can help or hurt us mentally. But maybe it’s better to worry about what you’re taking in off all your devices. All of the info in the world is at your fingertips online, so spend some time reading about something other than celebrities. Make things yourself. “The Ikea Effect” says we get more satisfaction from things we worked harder for, even if it’s just cooking a meal. Don’t try too hard to save money. While you do save by cutting out your morning latte, if that drink adds to your mood each day, your happiness may be worth the small cost. Befriend your friends’ friends. Creating social networks in real life by connecting to your friends’ other friends has shown to be satisfying for everyone involved. Make a change to your workspace. Studies show green in your workspace can help you concentrate, and that standing while you work can be better for your health. And don’t forget to love yourself! And have a Happy New Year! Read more stats, facts, and ideas about these resolutions from this The Guardian article.